Walt Disney World's spectacular All-Stars Movies Resort is conveniently located in the Animal Kingdom section of the park within two miles of the main 404 highway, and less than eight miles from the Magic Kingdom, Downtown Disney, Epcot, the Animal Kingdom theme park, and the ESPN World of Sports. 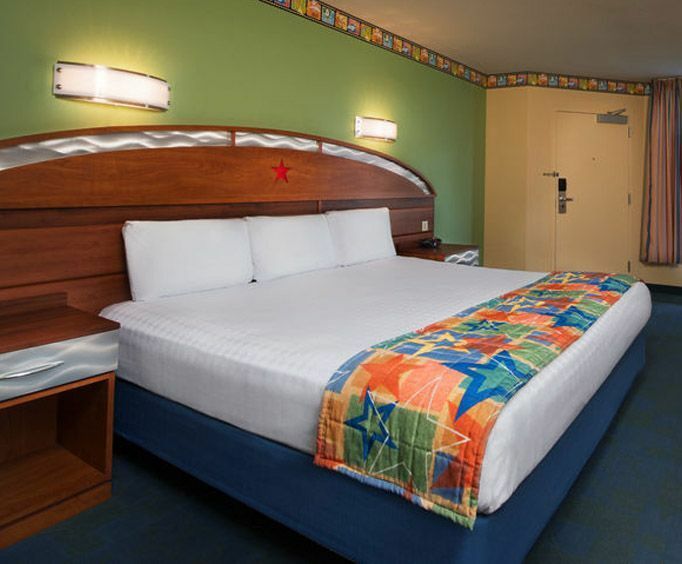 This fantastic movie themed resort salutes the most cherished Disney movies, and is fully equipped with amenities to satisfy your transportation, banking, casual dining, childcare, laundry, spa, and fitness needs. There's even a playground, a pool, an arcade and a gift shop. 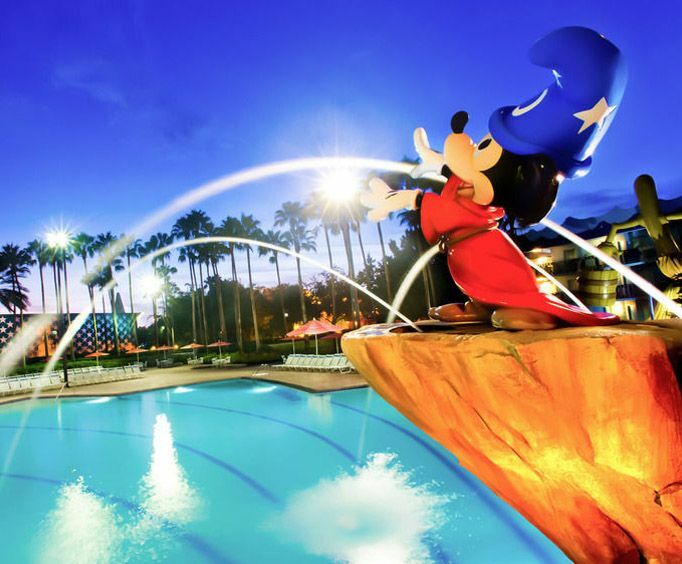 Timelessly lounge and sip a cool drink from the Silver Screen Spirits Bar as Mickey Mouse conjures fountains of water over the star shaped outdoor Sorcerer's Apprentice pool, where free movies under the stars are showcased in the evenings. Leisurely stroll courtyards beneath monolith sculptures of characters from 101 Dalmatians, Toy Story, The Love Bug, and Fantasia. Savor classic Disney cartoons at the World Premier Food Court while feasting on Mickey Mouse shaped waffles, French toast, and omelets for breakfast. Choose a standard or preferred room with a king sized or two double beds and a view of the courtyard or pool. Both options sleep up to four residents. Wheelchair and hearing accessibility features are available with roll-in showers and visual alarm clocks and notifications. All rooms are equipped with an in-room safe; high-speed internet, flat-screen televisions; ironing boards, hairdryers; telephones with voice messaging service, and alarm clocks with radio. 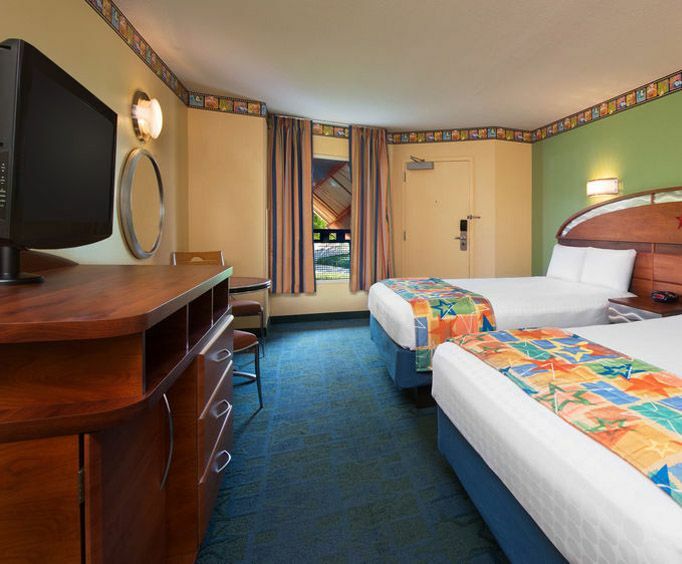 Disney's Magical Express offers complimentary transport to and from Orlando Airport and luggage delivery with advance reservations. Parking is complimentary for resort guests with a parking permit or a key to the world card.